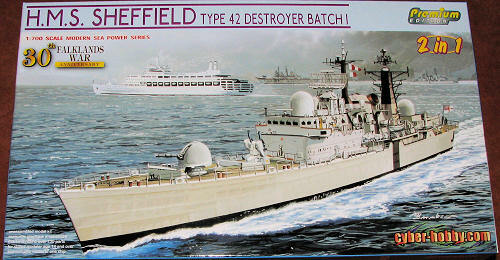 HMS Sheffield was the second Royal Navy ship to be named after the city of Sheffield in Yorkshire. She was a Type 42 Guided Missile Destroyer laid down by Vickers Shipbuilding and Engineering at Barrow-in-Furness on 15 January 1970, launched on 10 June 1971 and commissioned on 16 February 1975. An explosion during construction killed two dockyard workers and damaged a section of hull which was replaced with a section from an identical ship, ARA Hércules, being built for the Argentine Navy. The ship was part of the task force sent to the Falkland Islands during the Falklands War. She was struck by an Exocet air-launched anti-ship missile from a Super Etendard aircraft belonging to the Argentine Navy on 4 May 1982 and foundered on 10 May 1982. This is not the first issue of a type 42 destroyer from the folks at Cyber-hobby/Dragon, but it is an upgraded kit, mostly by adding a lot of photoetch. For instance, the p.e. fret includes railings, radar and other antenna as well as p.e. blades for the Lynx helo. Now you can use plastic for many of these items, but the photo etch just looks better. The kit is shown as only being able to be built as a full hull model, complete with display stand. However, a flat bottom is on the sprues for you to build a waterline version if you so wish. 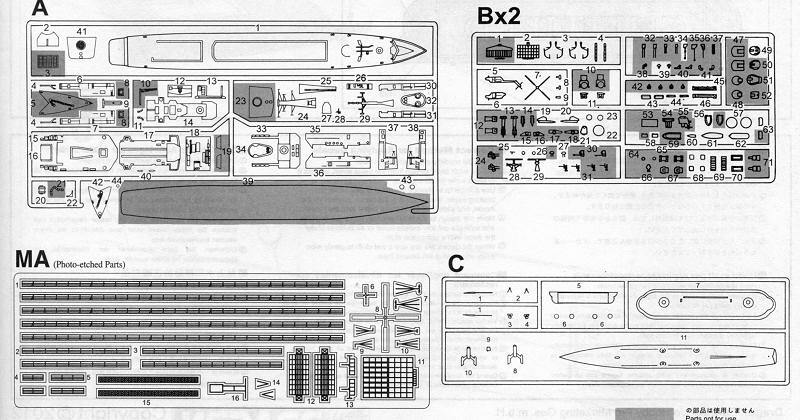 The kit can also be built as the Argentine ship ARA Hercules and the differences between the two ships are also shown. It also seems as if the HMS Coventry (another ship sunk during the Falklands war) can be built as well for the decals include that ship's numbers, and the instructions have info on mods required for that ship. Another interesting option are optional funnels. Instructions also show what needs to be removed in order to install the photo etch as it was originally designed without it. Color info is with Gunze and Model Master paints. The decal sheet is superbly printed and includes hull numbers and flight deck as well as gun markings. This one was released to commemorate the 30th anniversary of the Falklands War and with its upgrades, will make into a model that any ship builder will be pleased to have. Thanks to www.dragonmodelsusa.com for the preview kit. Get this beauty at your local shop or have them order it for you.